However, there’s one other type of storm that, according to the National Oceanic Atmospheric Administration (the U.S. government’s climatology branch), causes $1 billion in damage to crops and property each year—hail. —Covered parking can save you a lot of hassle and money, especially in the middle of the country. DisasterSafety.org has a map highlighting states that typically receive the most hail. If you live in one of the bright blue states, you should evaluate your parking options. —If you don’t have access to covered parking, another option is to find temporary shelter. Local malls, for example, usually have parking garages where you could park if you know a storm is brewing. 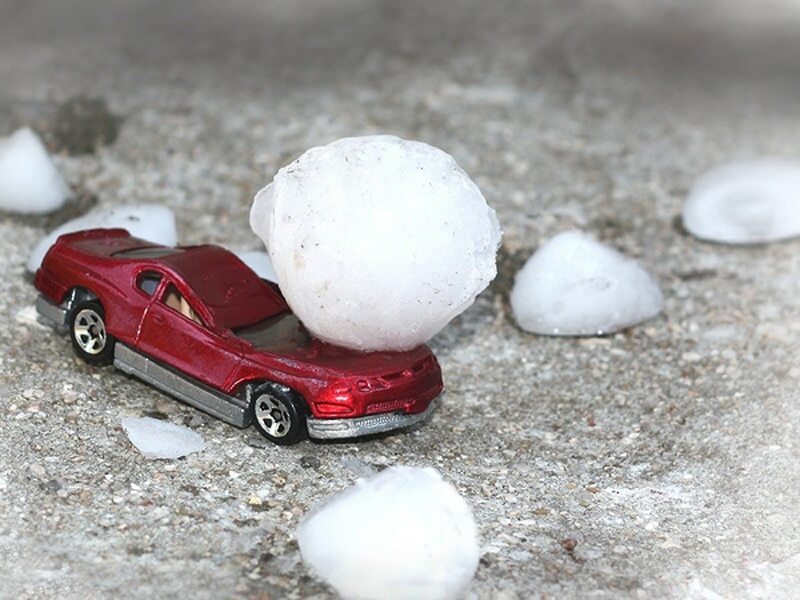 If you don’t have a covered place to store your vehicle, find those options for the big storms. —If you don’t have a shelter option, and you know a storm is coming, get something over your car. Some companies sell car covers specific to this purpose, but you can use your own blankets, as well. Just make sure you duct tape them down—the winds can pick up pretty quickly during hail storms. The tape can leave a sticky residue on your car, but most likely won’t cause any damage to the paint. —With insurance, “Comprehensive” doesn’t mean “all encompassing.” Instead, it’s the specific coverage that helps pay for damage caused by things like weather or fire. In most cases, Comprehensive will cover hail damage, too. Also, make sure you have Rental coverage—one in 10 Progressive policyholders who have a total loss (meaning their car is damaged beyond repair) do. And it’s an option that helps pay for a rental car if your car is being fixed or replaced. How hot can the interior of a car get – and how quickly?